Yankee Candle Clean Cotton Oil & Reeds is rated 4.3 out of 5 by 28. Yankee Candle Clean Cotton fragranced oil and reeds. With hand painted glass. 88ml. Up to 8 weeks consistent fragrance. 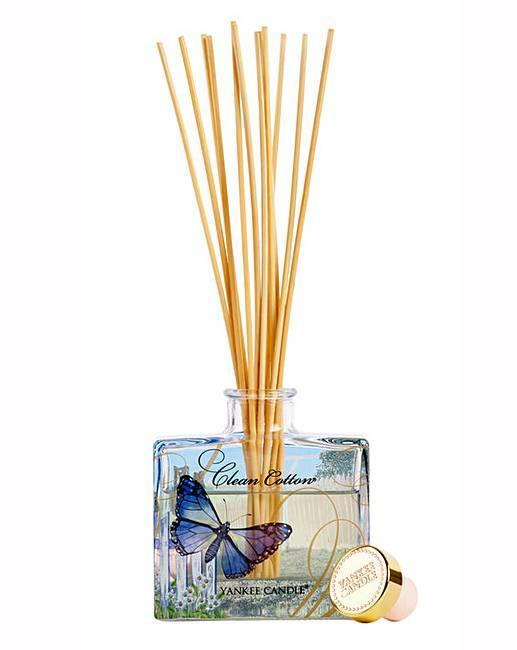 Clean Cotton; Sun-dried cotton combined with green notes, white flowers, and a hint of lemon. Rated 5 out of 5 by Lollypops from Looks really pretty I bought for a gift so I do not know what it smells like, but going of it's scent and the Yankee candle range in that scent I know it will smell gorgeous. Well worth the price considering buying myself one. Rated 1 out of 5 by Bessie 1912 from Disappointing I bought 2 of these. They hardly smell of anything. Rated 1 out of 5 by Janine from Waste of money I bought this about two weeks ago.does not smell at all.do not waste your money. Rated 5 out of 5 by motherhen999margie from Good display I have bought this for a gift for someone I think they will be very pleased with it.